Marine Resources - Meridian Environmental, Inc.
As part of the Washington State Ferries' Mukilteo Multimodal Transportation Project, Pacific Pile and Marine demolished an existing pier and dredged the shoreline at the new ferry terminal location in Puget Sound. Meridian completed a detailed SCUBA-based crab survey to assess potential Dungeness crab mortality during dredging. Divers sampled 15 randomly selected plots in a 58,000 square-foot area to determine the distribution and abundance of Dungeness, red rock, graceful, and kelp crabs in the proposed dredge prism. 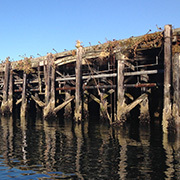 After mass failure of bulkheads at six properties on Maury Island in Puget Sound, Meridian conducted aquatic plant surveys prior to reconstruction efforts. Meridian evaluated if construction could be managed to avoid impacts to native aquatic plants and macroalgae. 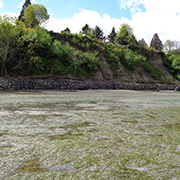 After the bulkheads were repaired, Meridian conducted an eelgrass delineation survey following the Army Corps of Engineers Eelgrass Delineation and Characterization Protocol in order to abide by Washington State Department of Natural Resources Right of Entry on aquatic lands. Surveys were completed via SCUBA, snorkel, and wading in the intertidal zone and reports were submitted to the DNR.